After five days of the pre-surgery, liquid-only meal plan, I was finally allowed to dig into something hearty that did not come served in a mug. I love you broth, but it was time to move on. Since I was still in recovery mode, my first meal out of the gate had to be something mild and delicate. Nothing with too much fiber or spice. But bland just isn’t in my vocabulary. So, even though the recipe I had in mind was somewhat colorless, I wanted to make sure it still had flavor. In the fridge, I had some leftover poached chicken breasts that I had used to make a simple broth the day before. 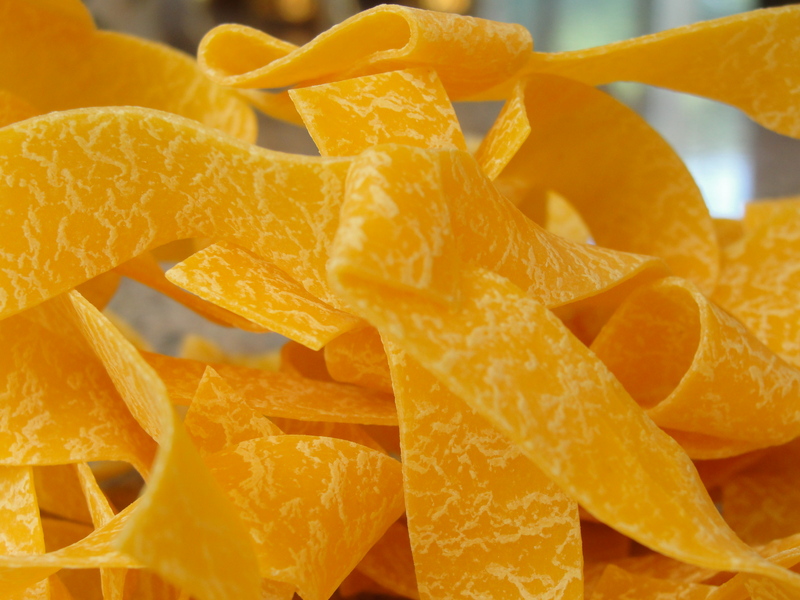 I also found some dried pappardelle pasta and Helluva Good low sodium cheddar cheese. Ingredients which all screamed, pasta time. But since everything was either old or spice-free, I had to figure out how to revive the natural tastes and breathe life back into each component. After two days in the fridge, the chicken breast was a little dry. So to add moisture, and make it a juicier piece of meat, I threw it in a non-stick pan with a splash of olive oil and white wine vinegar. 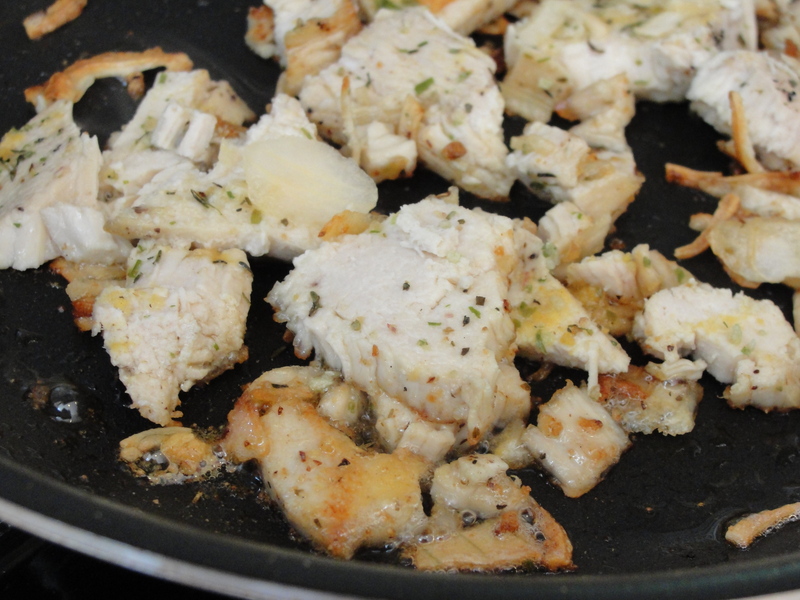 I sauteed the chicken over medium heat and added a sprinkling of dried onions, a little garlic powder, and a pinch of mustard. Just enough zest to wake the chicken up. As that sizzled, I boiled some water and cooked a handful of the pasta. Multi-tasking to cut down on cooking time. 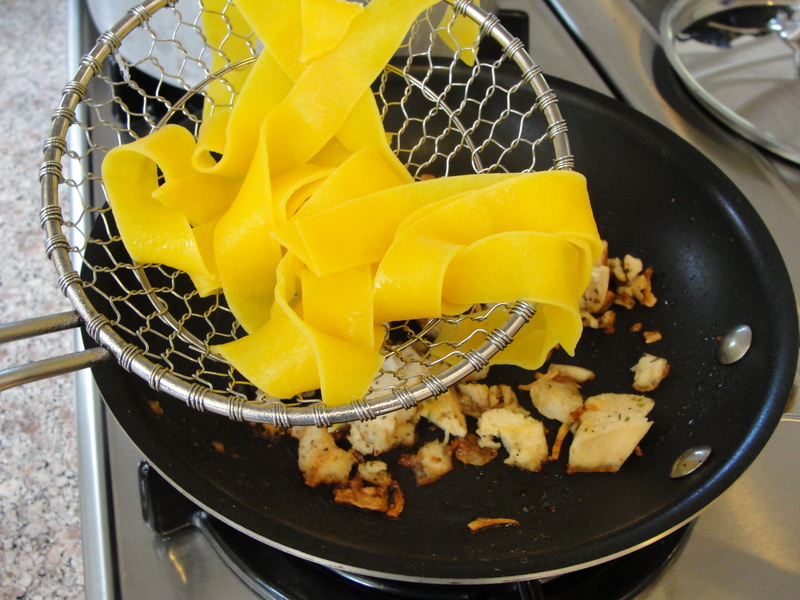 When the pappardelle was just soft enough, I used my spider skinner to remove the noodles and I added them directly to the pan with the chicken. 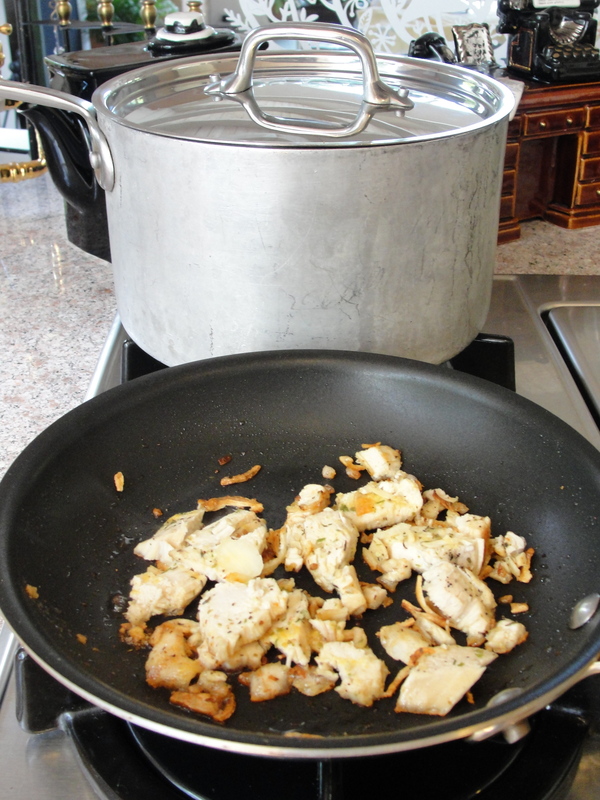 I also added about two tablespoons of the pasta water to make a simple sauce with the meat juices. 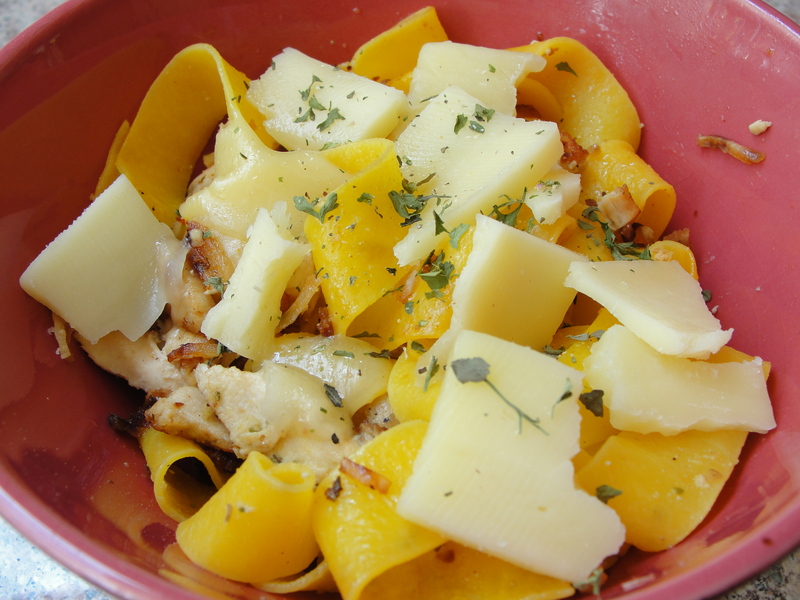 Once most of the water cooked off (about 2 more minutes), I put the pasta into a bowl and topped it with slices of the low sodium cheese, letting them slowly melt over the noodles. A few dried herbs on top, and I had the perfect, simple meal for one. All in all, this dish took me 15 minutes to make, with clean up included. 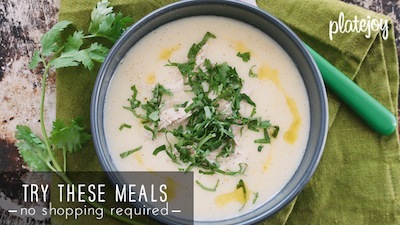 It was a great meal for a delicate tummy and is also a wonderful recipe for a late night, quick dinner. The lesson? Even when food is simple, the right ingredients can still give it flavor. Keep it tasty and chow on. glad the surgery went well. I’m glad to see you are up and eating again! Wishing you a quick recovery. Loved the broth recipes and am stashing them in a safe place for future reference. As an aside, I tried to order Helluva Good Cheese and was told it is on back order for 6 weeks! But on a lighter note was happy to order a case of Kettle Brand no salt chips from Amazon. $2.00 a bag – no shipping. Life is good. Thanks everyone for all the good wishes! I am feeling better than ever. Isn’t it great when you feel like you’ve taken health into your own hands? Oh yeah, and those great doctors help too. 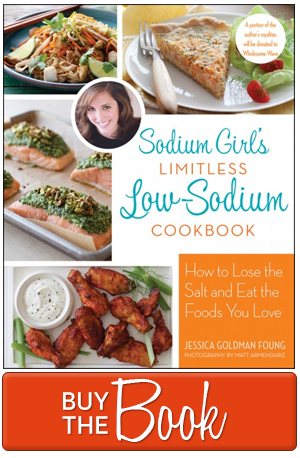 As for the cheese…do you think it’s because all the sodium girl readers are ordering it? Hopefully that will mean grocery stores will start carrying. Life is good! Glad you are back on your feet and recovering well , Sodium Girl. Hurray for good health, excellent doctors, a great attitude and good food. It´s always rewarding to make a nice meal from leftovers, isn´t it? Not only that it often leads to new recipes and new tastes but you also use up your leftovers instead of throwing them away (which I hate).